I love muffins. You may have figured that out seeing as how I have already posted over 20 recipes for muffins! I try to make my muffins healthier by loading them with dried fruit or nuts. (Blueberries and craisins are my favorite. )But sometimes my kids just want plain muffins. 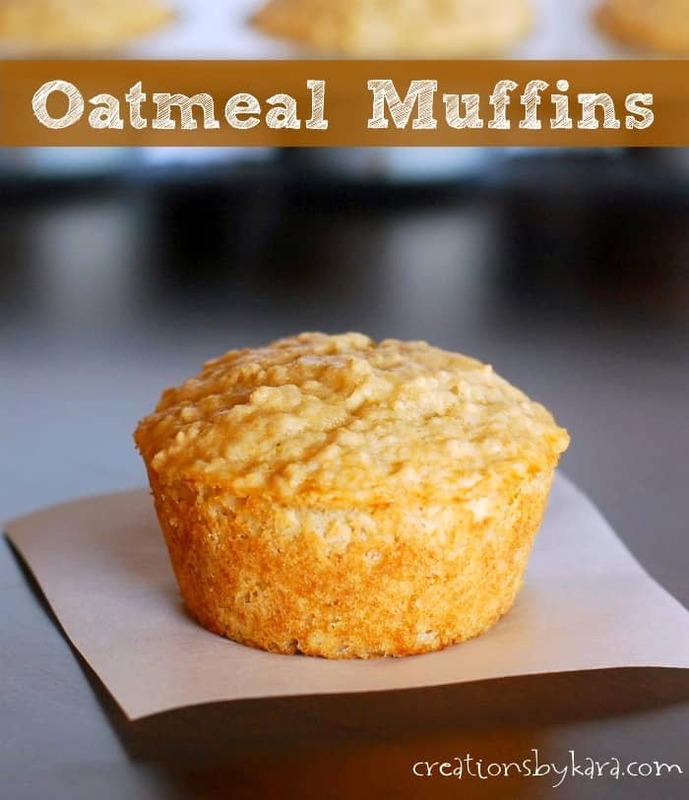 On those days I make either my whole wheat muffins, or this recipe for oatmeal muffins. They eat them just about as fast as I can pull them out of the oven! 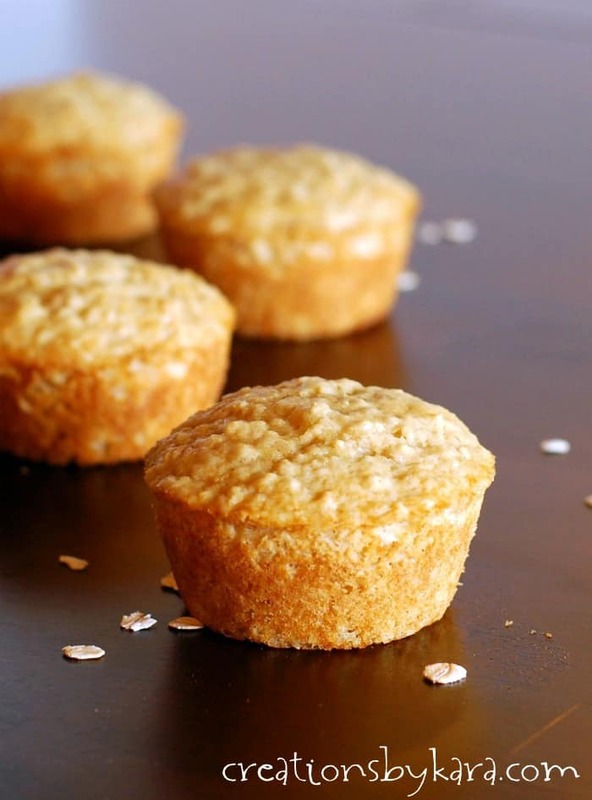 These muffins are healthy and hearty thanks to the oats. But the addition of the buttermilk makes them nice and tender. They also freeze really well, which is great for busy school mornings when there isn’t even time for cereal and you have to toss breakfast at your kids as they run out the door. Who decided that buses should come at 7 am anyway? Stir together oats and buttermilk in a mixing bowl. Let sit for 15 minutes. Whisk in the egg, vanilla, brown sugar, and oil. Stir in dried fruit and dry ingredients just till moistened. Spoon into well greased or paper lined muffin cups. Bake at 350° for 15-18 minutes. If you add the dried fruit, you will get 12 muffins. If you leave it out, you'll get 10. These are nice and moist. I managed to get 9 really large muffins out of my first batch, but found them a little bland. Ran to the store to get regular “large” liners and added a little lemon zest and 1/4 tsp nutmeg to the second batch. This time I got 14 regular sized muffins. My mother-in-law made marmalade today, so I thought these would be perfect with that! I just made these fabulous muffins. I added a small teaspoon of strawberry jam to the middle of the batter in each muffin cup… Oh my goodness, pure heaven. That is a great idea! Who wouldn’t love a little surprise inside? Hi,I just tried this recipe and doubled it.I made breakfast bars.They were awesome, but tweaked for healthier version.I used 1/4 c . coconut oil,1/4 c.butter for oil.I used 1 cup oat bran for oatmeal 1 cup oatmeal.1/4 c.honey for brown sugar.2 scoops of protein powder (vanilla).3 scoops of psyllium hulls powder for fiber.Last but not least.2 cans of wild blueberries drained.1 cup chopped walnuts.Thanks again. These were fantastic! I used white whole wheat flour in place of the flour in the recipe & they were super light & fluffy! These look delicious. Sometimes it’s nice to see a simple muffin recipe without a zillion add ins. I bet these would be delicious for breakfast with some jam and a nice cup of coffee :). They are delicious with jam- or honey butter!